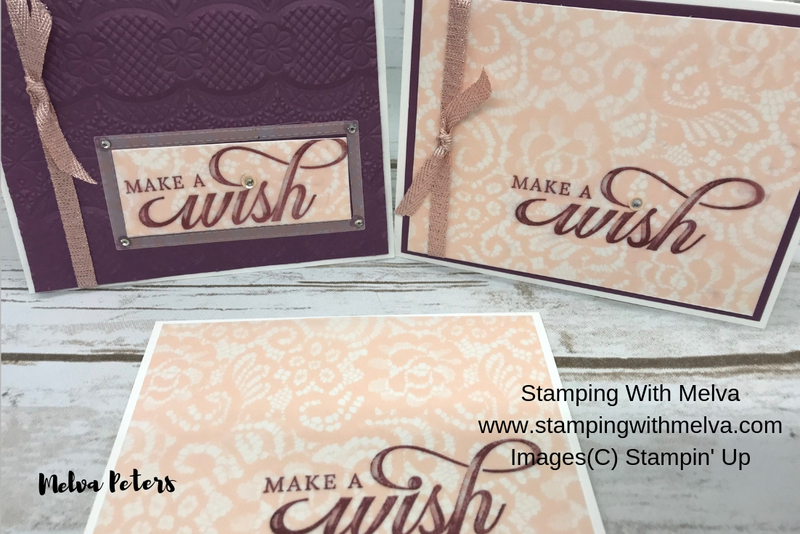 Today I'm featuring the Life Is Grand stampset and three ways to use it for the beginner stamper, the casual stamper and the avid stamper. 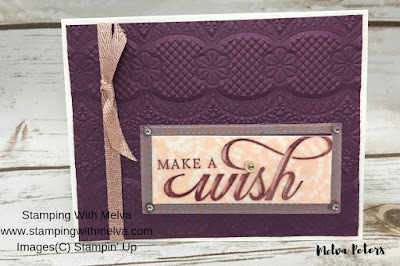 As a beginner stamper, you are new to stamping or have never tried stamping. You don't own stamping supplies but may be somewhat crafty and enjoy trying new things. Does this describe you? Here's a card I made which a typical "new" stamper could easily do with a stampset, ink and paper. The Designer Series Paper is optional here but can be used to give your card a pop of colour. Score Whisper White Thick card stock (5 1/2" x 11") in half to make card base. Cut piece of Floral Romance Designer Series Paper Vellum (4" x 5 1/4"). Stamp sentiment in Fresh Fig ink. Adhere to card base using a Glue Dot in each corner. 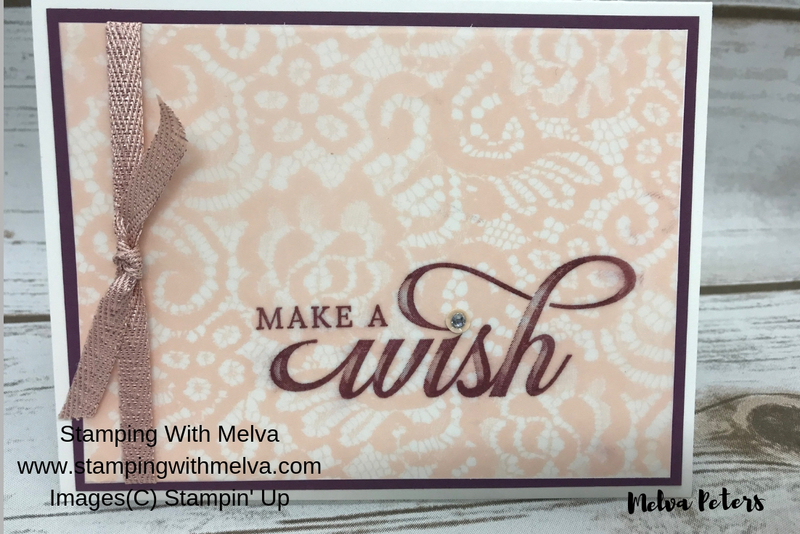 As a "casual" stamper you own some supplies, stamp around once a month, like stamping but also leave time for other crafts or hobbies. You have a collection of some stamps, some inks and some paper, maybe even some punches, but most likely do not have a Big Shot die cutting machine due to the investment required. You like to come to classes and parties and always love a sale or promotion! Does this describe you? Cut piece of Floral Romance Designer Series Paper Vellum (3 3/4" x 5"). Stamp sentiment in Fresh Fig ink. 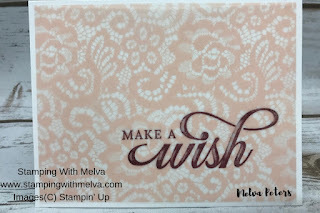 Adhere a piece of Powder Pink ribbon around back of card front using Snail. Cut a small piece of ribbon and tie around the ribbon around card front. Adhere a Basic Adhesive-backed sequin above the "i" and add a rhinestone. Now for the "avid stamper". 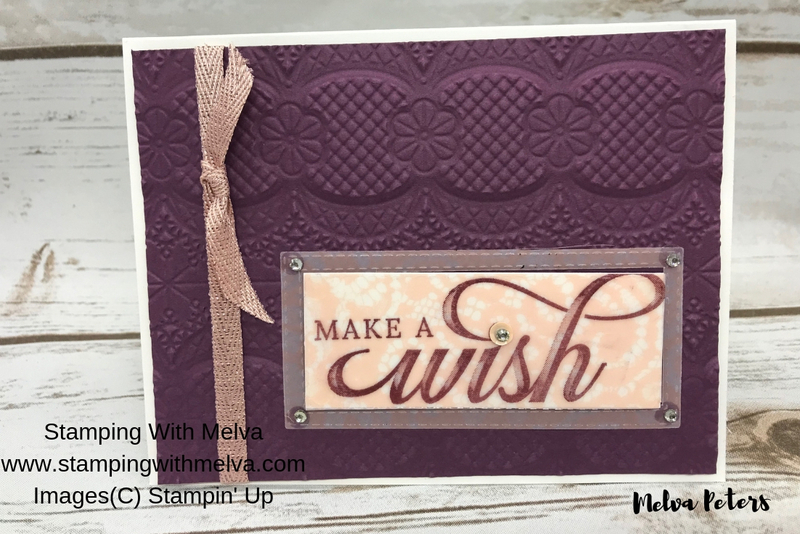 You love stamping more than just about any other activity! It is your primary hobby, artistic medium and fun time passion. You love to talk about it, share it and stamp as much as possible. Avid stampers frequently stamp every day and are constantly eager to see and hear all the latest news about new products or techniques. You have moved from owning a few supplies to collecting everything you like! You have all the tools and know how to use them and aren't afraid to try new things. This definitely describes me! How about you? Stamp the sentiment on a piece of Floral Romance vellum using Fresh Fig ink. Adhere to a piece of Whisper White Thick cardstock of the same size using Glue Dots in the corners. Cut out using Stitched Rectangle Framelits - use 2 framelits - one to fit around the sentiment and the other larger. When cut out you will have a frame. 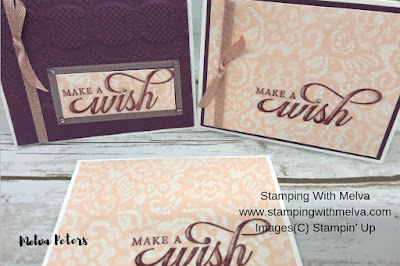 Adhere to embossing Fresh Fig cardstock using Snail for the stamped piece and Glue Dots in the corners for the frame. 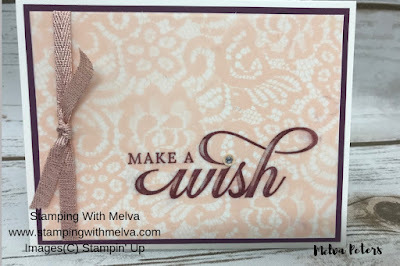 Adhere a piece of Powder Pink ribbon around back of card front using Snail. Cut a small piece of ribbon and tie onto piece around card front. Adhere a Basic Adhesive-backed sequin and a rhinestone on each for the corners of the frame.